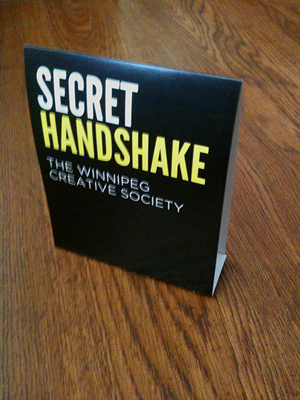 Secret Handshake is a group organized by Leanne Havelock and Christopher Lobay specifically for the purpose of getting creative industry people, especially freelancers, to get together, meet each other, network, and ideally have a good time. The group is still relatively young and tries to set up a monthly Meetup at local pubs, two elements that I, for one, find very appealing. I am not a person who has an easy time meeting new people and I certainly do not "network" well, but if you gather a group of people who are all interested in the same topics and subjects in a casual environment, everything smooths itself out. Though I had to duck out at ten, apparently missing a brilliant set by Shuttle, I had a great time. Before crashing for the night, I made a note to log on and twitter follow, facebook friend, online stalk, etc as many of those fine folk as I could. I was just so charged from being able to talk about things that so interested me with people who were also so interested in these same things! I only had two disappointments. One, I'm embarrassed to admit that though I met a lot of very cool and very interesting people, I do not remember most of their names O_O I apologize to everyone, and hope to rectify that with future meetups. Someone made the suggestion of sticker name tags with our real names, twitter tags, and twitter avatars on it... we laughed, but we were all thinking it was also not a bad idea. There were a couple people that, due to sickness or schedules, could not make it out, but have assured me that'll they'll be at the next one. I am already looking forward to the next Meetup, or any opportunity to just share a pint with many of these creative folk.